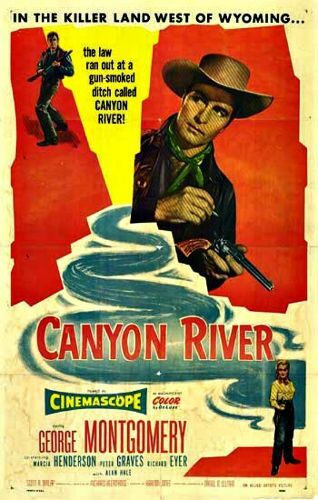 Canyon River stars George Montgomery as trail boss Steve Patrick. Reversing the procedure usually depicted in westerns of this nature, Patrick is assigned to guide a cattle drive from the west-coast state of Oregon to the wilds of Wyoming. En route, our hero must fend off attacks from both rustlers and Indians. He is also being undermined from within by foreman Bob Andrews (Peter Graves), who dearly covets Patrick's job. The romantic interest is provided by widowed camp cook Janet Hale (Marcia Henderson). Canyon River was produced by Richard Heermance, who, for the record, was (a) the brother of announcer Bud Collyer and actress June Collyer and (b) the brother-in-law of comedian Stu Erwin.